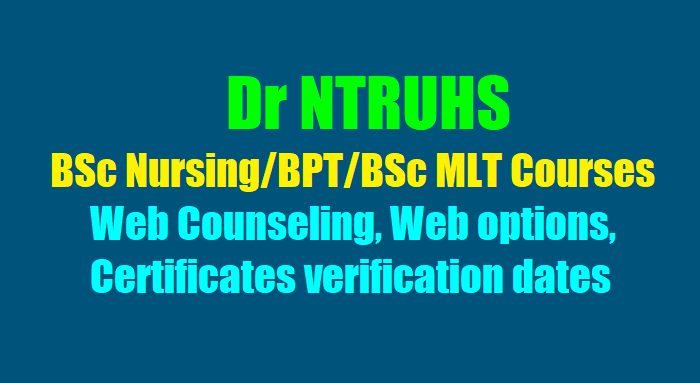 Dr NTRUHS BSc Nursing/BPT/BSc MLT Web Counseling, Web options, Certificates verification dates: Dr NTRUHS BSc Nursing/BPT/BSc MLT 1st Phase Web Counseling / Paramedical Courses Certificates Verifcation: Dr NTRUHS BSc Nursing/BPT/BSc MLT 1st phase Web Counseling for exercising options for admission into BSC(Nursing), BPT and BSc(MLT) Courses for 2018. Dr. NTR UHS hereby notify that the first phase of web based counseling for exercising options the candidates those who have attended for certificates verification as per the schedule notified by the University are only eligible for giving Web Options for admissions into B.Sc., (Nursing) 4 YDC, Bachelor of Physiotherapy (BPT) and B.Sc., (Medical Lab Technology) courses for the academic year 2018 in affiliated colleges located in Andhra Pradesh will be conducted as per schedule. Notification for exercising web options for the First Phase of web based st Phase of web basedcounsel counsel counselling for admission ing for admission into BSc(Nursing) into BSc(Nursing)4YDC/ P.B. B.Sc 4YDC/ P.B. B.Sc 4YDC/ P.B. B.Sc. (Nursing) 2YDC/ B.P.T. / B.Sc (Nursing) 2YDC/ B.P.T. / B.Sc (Nursing) 2YDC/ B.P.T. / B.Sc. (MLT)Courses in Government (MLT)Courses in Government & Private colleges affiliated to & Private colleges affiliated toDr. NTR University of Health Sciences. Dr. NTR University of Health Sciences. Dr. NTR University of Health Sciences. In continuation of earlier notifications dated: 05.09.2018 Dr. NTR University of Health Sciences, Vijayawada, Andhra Pradesh State proposes to conduct first phase of web-based counselling for Admission into B.Sc. (Nursing) 4YDC/P.B. B.Sc. (Nursing) 2YDC/ B.P.T. / B.Sc. (MLT) Courses in Colleges affiliated to the University. Candidates can exercise web options as per schedule given below in the given below in the Website: https://paramed.apntruhs.in (including Special category PH candidates). The candidates whose original certificates have been verified and whose names have been notified in the merit list for the courses displayed on Dr. NTR UHS web-site are directed to exercise web options for admission into B.Sc. (Nursing) (Nursing) (Nursing)4YDC/P.B.B.Sc (Nursing) 2YDC/ B.P.T. / 4YDC/P.B.B.Sc (Nursing) 2YDC/ B.P.T. / B.Sc. (MLT)Courses Courses Courses for the academic year 2018-19 into the affiliated Colleges of Dr. NTR UHS, Vijayawada, Andhra Pradesh. All the candidates figured in the final merit lists for B.Sc. (Nursing) (Nursing) (Nursing) 4YDC/P.B.B.Sc. 4YDC/P.B.B.Sc. (Nursing) 2YDC/ B.P.T. / B.Sc (Nursing) 2YDC/ B.P.T. / B.Sc (Nursing) 2YDC/ B.P.T. / B.Sc. (MLT)Courses are eligible (MLT)Courses are eligible (MLT)Courses are eligible to exercise web options. Allotment of seats will be done as per Government & University Regulations. University Fee: a).For B.Sc. (Nursing) (Nursing) (Nursing) 4YDC/ P.B.B.Sc P.B.B.Sc P.B.B.Sc. (Nursing) 2YD . (Nursing) 2YD . (Nursing) 2YDC/ B.P.T. / B.Sc / B.P.T. / B.Sc / B.P.T. / B.Sc. (MLT)Courses (MLT)CoursesRs. 5000/ (Rupees Five thousand only). Rs. 5000/ (Rupees Five thousand only). Selected Candidates have to pay University fee through payment gateway using online payment method. (Debit Card / Credit Card / Internet Banking). Tuition Fee: As per existing Government guidelines for Government & Private colleges (i.e., G.O.Ms.No.153,H.M & F.W (C2) Dept., dated.12-09-2017, Rs.17,600/- p.a. for Private un-aided Non-Minority Colleges). • Candidates can exercise web options through https://paramed.apntruhs.in https://paramed.apntruhs.in from home or any other place having internet facility. Use only system with Internet Explorer versions 11 or above. Do not use Tabs or Mobiles to versions 11 or above. Do not use Tabs or Mobiles to exercise web options. obiles to exercise web options. exercise web options. • Candidates can exercise options to all courses and colleges to which they are eligible if their name is included in the merit list for the course. • Candidates are advised to read the regulations and prospectus carefully before exercising prospectus carefully before exercising web options. web options. • One time pass word will be sent to the registered mobile number at the time of exercising web options after saving Options. The password consists of SIX letter code with English capital A to Z. capital A to Z. • Candidates are instructed to take a print out of sa Candidates are instructed to take a print out of saved options. nstructed to take a print out of saved options. ved options. • Candidates will receive the message on their registered mobile after allotment of seat. If allotted. • Candidate has to download the allotment letter by paying the University Fee through payment gateway. payment gateway. • Candidate has to take print out of allotment order. Check their allotment and report to the Principal of respective college before the date specified on the allotment letter. specified on the allotment letter. • The selected candidates shall report to the Principal with all original certificates, pay the al with all original certificates, pay the College fee before the last date and time at the allotted college as mentioned in the allotment letter. allotment letter. • Original certificates will not be returned to candidates unless the candidate discontinues from the course. from the course. • The University Fee and other fees once paid shall n The University Fee and other fees once paid shall not be r ot be refunded under any efunded under any circumstances. circumstances. No individual communication will be sent to the candidates. Candidates are advised to check the Dr. NTR UHS web-site from time to time for notification regarding schedule for exercising web-options and counselling. Candidates are advised to refer to the Prospectus of each course displayed on Dr. NTR UHS web-site http://ntruhs.ap.nic.in for eligibility criteria and any other details. Eligibility for B.Sc., (Nursing) 4 YD Course: The minimum age for admission shall be 17 years on 31st December of the year in which admission is sought. Minimum Education: 10+2 Passed @45% aggregate of marks in science (Physics, Chemistry and Biology) and English is compulsory subject. 10+2 passed out from recognized board under AISSCE/ CBSE/ ICSE/SSCE/ HSCE/NIOS/APOSS or other equivalent Board with Physics, Chemistry and Biology. Intermediate Vocational with Bridge Course in Biological and Physical Sciences. Those who belongs to SC, ST and BC are eligible with 40% in the Science Group subjects and English is compulsory subject as per orders of the Secretary Indian Nursing Council, New Delhi vide letter No.F.No.1-2/2014-INC and vide the circular No. F.NO.1-6/2016-INC, Dated.21-09-2016. Male and female Candidates are eligible for admission into Post Basic B.Sc., (N) 2 Years Course as per 228th EC resolution dated 05.05.2018. Candidates seeking admission into Post Basic B.Sc., (Nursing) Course should have passed Intermediate Examination. Any other equivalent examination (10+2 pattern) recognized by the University in A.P. or Board of Intermediate Education Andhra Pradesh or NIOS or APOSS – Indian Nursing Council Regulations. Should have passed General Nursing and Midwifery from an institution recognized by the Govt. of A.P. or Nursing Council of India and shall be registered with the State Nursing Council. (Eligibility Criteria is as per G.O.Ms.No.269, HM & FW (K2) Dept., Dt. 30-11-2009 as amended in G.O.Ms.No.194, HM & FW (K2) Dept., Dt. 07-07-2011, G.O.Ms.No.40, HM & FW (K2) Dept., Dt.18-02-2012 and G.O.Ms.No.33, HM & FW (K1) Dept., Dt.05-03-2013 and from time to time. Government Service Candidates: Should have completed 2 years of service as a staff nurse in Medical and Health Department and Andhra Pradesh Vaidya Vidhana Parishad as on 30.06.2018. Service certificate as a staff nurse issued by the respective employer should be enclosed. Must be a regular employee. Service certificate and regularization orders as staff nurse should be produced at the time of original certificate verification. Age: Candidate should have completed 17 years of age and should not be more than 45 years of age as on 31st December of the year of admission. In case of SC / ST Candidates the maximum age shall be relaxed by 3 years. The candidates are directed to bring all the original certificates (mentioned below) and two sets of Xerox copies. 5 Study certificates from 6th Class to Intermediate. A candidate who has not studied in the any school, a residency certificate for that period only shall be submitted. 9 The candidates claiming fee exemption shall produce the latest Income certificate of the Parent issued by MRO / Tahsildar. 11 For Post Basic B.Sc. (Nursing) 2 YDC : in addition to above GNM Marks Memo, pass certificate and Nursing Council Registration certificate. The candidate should have completed 17 years of age as on 31-12-2018. The candidates who do not complete 17 years as on 31-12-2018 need not attend the counseling. The candidates born on or after 02-01-2002 are not eligible for admission into the above Courses. Candidates please note that this is the first and final phase of verification of original certificates. No further phase of verification of original certificates will be done. Candidates who got verified their original certificates can only exercise their web options in the subsequent phases if any. The students belonging to SC/ST/BC/EBC/Disabled/Minority categories will be considered for reimbursement of Tuition Fee to the students is subject to verification and eligibility criteria prescribed by the State Governments of Andhra Pradesh. Tuition fee as prescribed by the Government of Andhra Pradesh. If any new colleges are affiliated for the year 2018-19 before date of counseling, the seats in those colleges will also be filled. Notification for exercising web options for the First Phase of web based counselling for admission into BSc(Nursing) 4YDC/ P.B. B.Sc. (Nursing) 2YDC/ B.P.T. / B.Sc. (MLT)Courses in Government & Private colleges affiliated to Dr. NTR University of Health Sciences. In continuation of earlier notifications dated: ....., Dr. NTR University of Health Sciences, Vijayawada, Andhra Pradesh State proposes to conduct first phase of web-based counselling for Admission into B.Sc. (Nursing)4YDC/P.B. B.Sc. (Nursing) 2YDC/ B.P.T. / B.Sc. (MLT) Courses in Colleges affiliated to the University. Candidates can exercise web options as per schedule given below in the Website: http://paramed.apntruhs.in (including Special category PH candidates). The candidates whose original certificates have been verified and whose names have been notified in the merit list for the courses displayed on Dr. NTR UHS web-site are directed to exercise web options for admission into B.Sc. (Nursing) 4YDC/P.B.B.Sc (Nursing) 2YDC/ B.P.T. / B.Sc. (MLT)Courses Courses for the academic year 2018-19 into the Colleges in Andhra Pradesh. All the candidates in the final merit lists for B.Sc. (Nursing) 4YDC/P.B.B.Sc. (Nursing) 2YDC/ B.P.T. / B.Sc. (MLT)Courses are eligible to exercise web options. Allotment of seats will be done as per Government & University Regulations. University Fee: a).For B.Sc. (Nursing) 4YDC/ B.P.T. / B.Sc. (MLT)Courses Rs. 5000/ (Rupees Five thousand only). Selected Candidates have to pay University fee through payment gateway using online payment method. (Debit Card / Credit Card / Internet Banking). b).For P.B.B.Sc. (Nursing) 2YD Course Rs. 5500/ (Rupees Five thousand Five Hundred only). Selected Candidates have to pay University fee through payment gateway using online payment method. (Debit Card / Credit Card / Internet Banking). Tuition Fee: As per existing Government guidelines for Government & Private colleges (i.e., G.O.Ms.No.153,H.M & F.W (C2) Dept., dated.12-09-017, Rs.17,600/- p.a. for Private un-aided Non-Minority Colleges). · Candidates can exercise web options through http://paramed.apntruhs.in from home or any other place having internet facility. Use only system with Internet Explorer versions 11 or above. Do not use Tabs or Mobiles to exercise web options. · Candidates can exercise options to all courses and colleges to which they are eligible if their name is included in the merit list for the course. · Candidates are advised to read the regulations and prospectus carefully before exercising web options. · Candidates are informed that they have to give options to the course and colleges in which they are interested to join. In case the candidate does not join the course/ college after allotment he / she will not be allowed to exercise web-options in subsequent counseling. · One time pass word will be sent to the registered mobile number at the time of exercising web options after saving Options. The password consists of SIX letter code with English capital A to Z. · Candidates are instructed to take a print out of saved options. · Candidates will receive the message on their registered mobile after allotment of seat. If allotted. · Candidate has to download the allotment letter by paying the University Fee through payment gateway. · Candidate has to take print out of allotment order. Check their allotment and report to the Principal of respective college before the date specified on the allotment letter. · The selected candidates shall report to the Principal with all original certificates, pay the College fee before the last date and time at the allotted college as mentioned in the allotment letter. · Original certificates will not be returned to candidates unless the candidate discontinues from the course. · The University Fee and other fees once paid shall not be refunded under any circumstances. my sister got merit order of bsc nursing 4yrs(2016-2017) in ntruhs.ap.nic.in. but I dont know when is the counselling dates? The persons are not responding to calls and emails which are given in that site. How can I Know the date of counseling?? Please. Its urgent. Reply if anyone knows. Thank you.